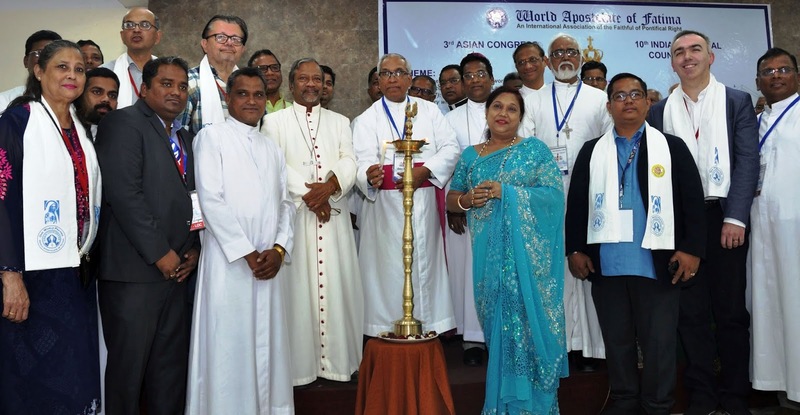 The 3rd Asian Congress and also the 10th National Council Meet of the World Apostolate of Fatima (WAF) was held at Seva Kendra under the Archdiocese of Calcutta. MISSION: This is to spread Our Lady of Fatima’s Message of Peace for the salvation of all through holiness. The selected Theme was “...God wishes to establish in the world devotion to My Immaculate Heart...” (Our Lady of Fatima, 13 July 1917): “Into the abode of the Immaculate Heart of Mary with St Teresa of Calcutta.” The message calls for Sacrifice of daily duties, observance of God’s law as penance and keeping God first, daily Rosary for peace, prayers and sacrifices daily offered for the sinners and in reparation to the Eucharistic Jesus and the Immaculate Heart of Mary, through the devotion of the Five First Saturdays of the month and Consecration. 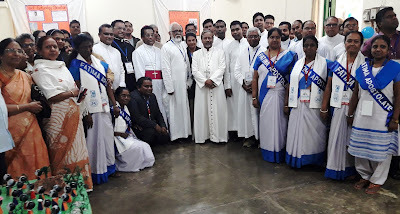 ARRIVAL: Most of the delegates and observers arrived on Saturday 2nd February 2019, This was the feast of the Presentation of The Lord which is also the Feast Day of Consecrated Life and also a First Saturday. In the evening, blessing of candles was done with a procession from Don Bosco’s Nitika reciting the Holy Rosary from the Grotto. 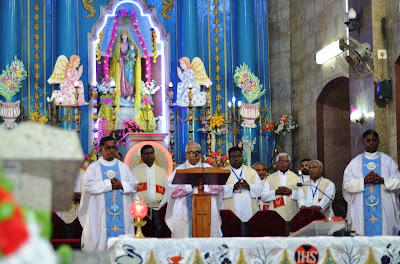 Archbishop Thomas D’ Souza, Archbishop of Calcutta was the main celebrant for the Holy Mass. 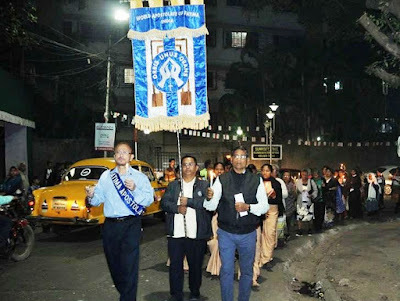 PILGRIMAGE: On Sunday 3rd February: day 1, after the Morning Prayer, the delegates were transferred by bus to the Basilica of the Most Holy Rosary, Bandel for the annual First Sunday of February celebrations. 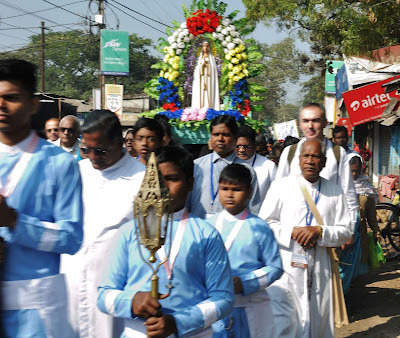 The traditional Rosary procession was taken out from Bandel Railway Station with the Statue of Our Lady of Fatima. 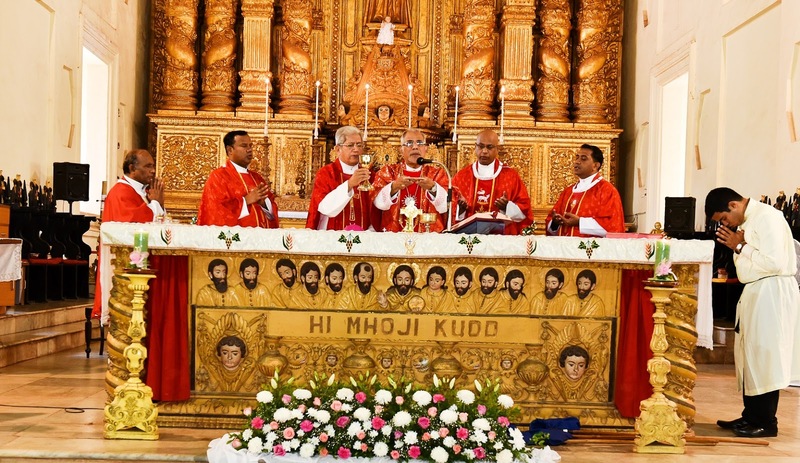 Archbishop Thomas D’Souza also joined and was the main celebrant for Holy Mass. He mentioned that Fatima in Portugal and Bandel in India are connected by Mary Our Mother to give Jesus to us. We are all called for change of heart from sin to holiness. Over 1,000 attended. After the homily, the Pledge to Our Lady of Fatima was renewed and the Consecration of the State to the Immaculate heart of Mary was done before the final blessing. After lunch, our International President, Prof Americo Pablo Lopez Ortiz, spoke on “How we can help Our Lady of Fatima.” Fr M. V. Sunny, the outgoing Chairman of the Indian National Board summarized the talk in Bengali and explained the history of the Bandel Basilica. After venerating the Statue of Our Blessed Lady of Happy Voyage, they returned back. WELCOME and KEYNOTE ADDRESS: On Monday 4th February: day 2 after inviting the Holy Spirit, St Michael’s prayer, Memorare, Morning Offering, the Statue of Our Lady of Fatima was crowned and a Rosary was placed in Her hands by Archbishop Thomas of Calcutta. The leaves of the Fatima Tree poster helped gather funds. 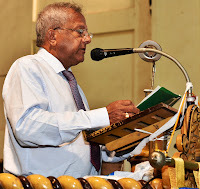 Fr M. V. Sunny welcomed all and as a sign, an Utheron (fine shoulder shawl) was presented to all. 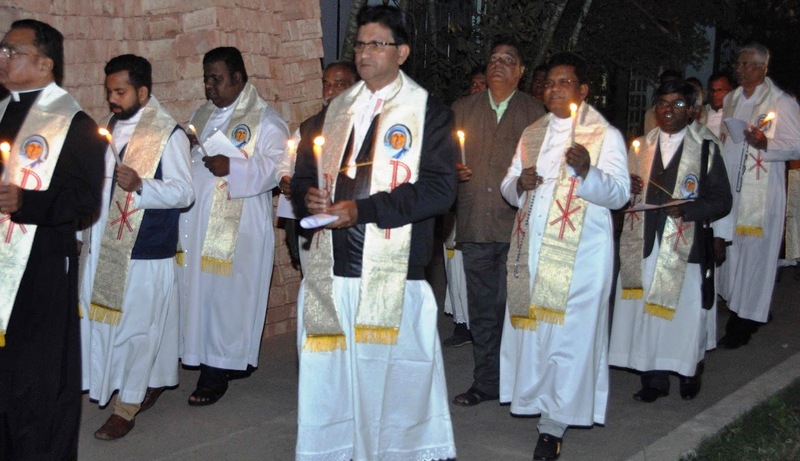 Then the traditional lamp was lit, proclaiming Jesus as the light of the world. 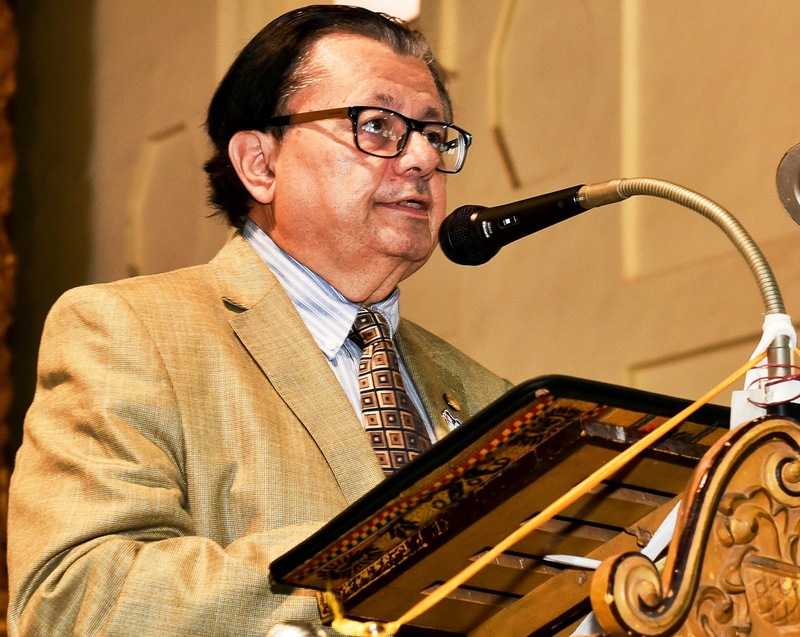 Dr Celcio Dias read the proposal to the amendment to our National Statutes in Article 6.5: Current National Executive Board members are ex Officio delegates in the next National Council Meeting. The duty of the current Executive Board will conclude with the conclusion of next National Council Meeting. 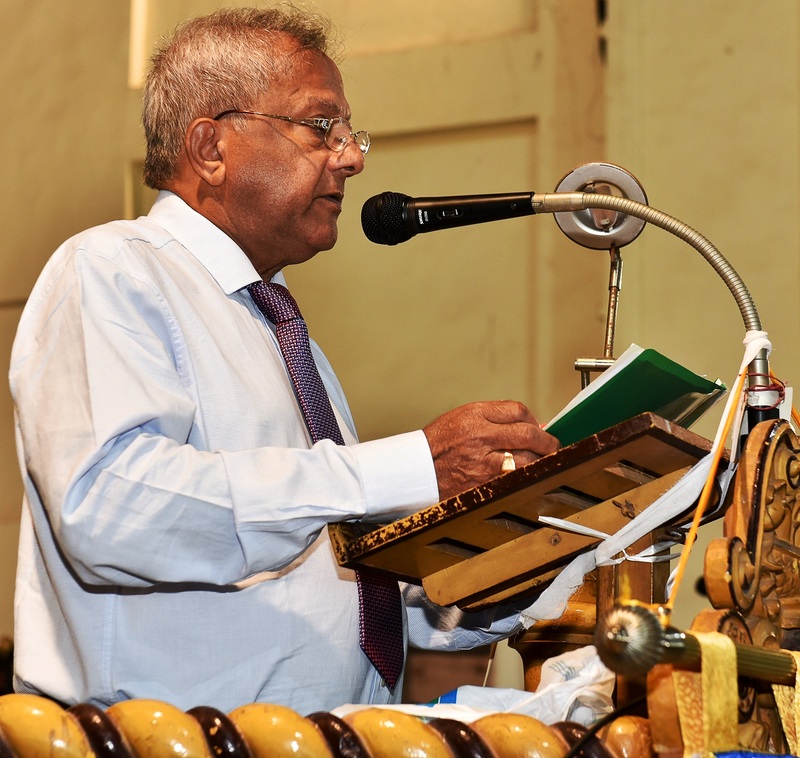 The new Board will take charge at the conclusion of the National Council Meeting. This was passed unanimously. Then Mr Reynald Andales, Treasurer of the WAF International Board presented the WAF Formation programs and structure in Philippines. Archbishop Peter Machado, Archbishop of Bangalore and Indian National Ecclesiastical Advisor was the main celebrant at Holy Mass, concelebrated by Bishop Salvadore Lobo of Baruipur, Archbishop Thomas D’ Souza and almost 50 Priests. This was followed by the Keynote Address by Prof Americo Lopez-Ortiz, International President of the WAF: “God wishes to establish in the world devotion to My Immaculate Heart” Then the Fatima exhibition was inaugurated and a press brief was given to about 15 media persons on Our Lady’s Message of Peace for all . 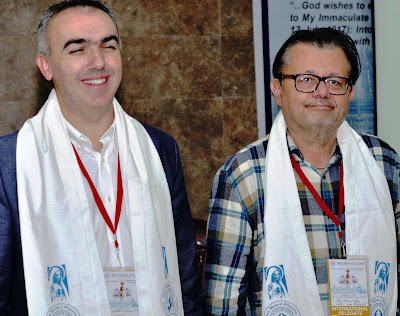 DELEGATES: Prof. Americo Pablo Lopez Ortiz, our International President from Puerto Rico; Mr Nuno Prazeres Director of our International Secretariat at Fatima, Portugal; Fr. 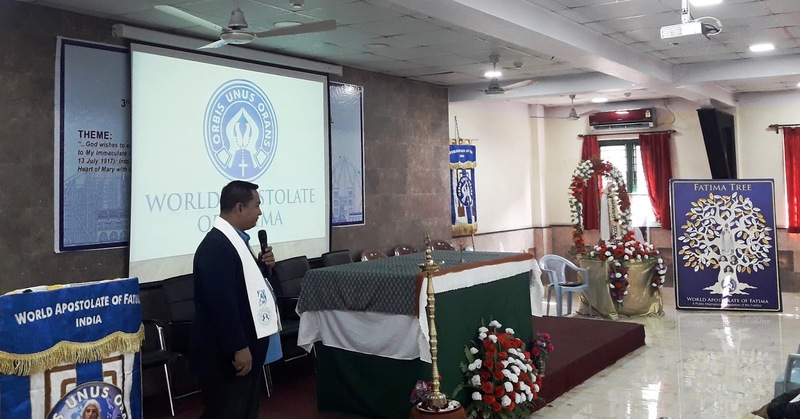 S. N. Shelton Dias and 20 from Sri Lanka, Reynald Andales from Philippines, Fr.Shin Maria, Fr.Park Kim and Sr. Marie Michaela from S. Korea, Mr Godfrey L. Caluna from Oman were the foreign delegates. 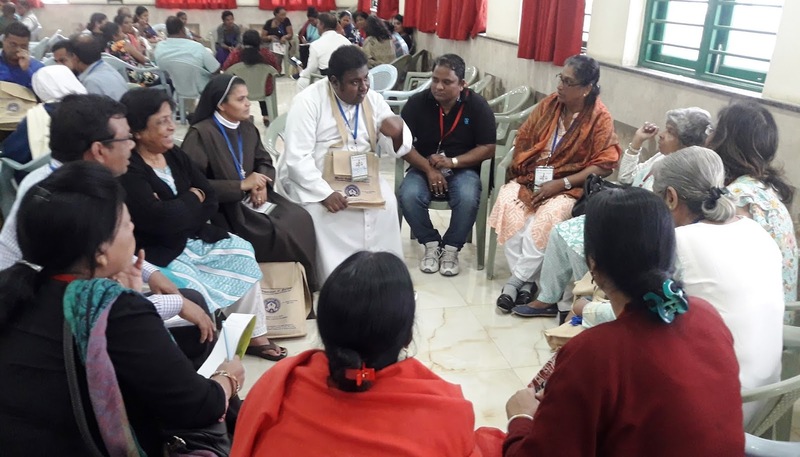 Indians of 32 delegates, 40 observors, including 17 Priests and 5 nuns were from Agra, Asansol, Balasore, Baroda, Bangalore, Bombay, Buxar, Calcutta, Delhi, Goa, Krishnagar, Mangalore, Meerut, Nashik, Pondicherry, Raiganj, Simla-Chandigarh, Vijaypuram and Warangal. Altogether 4 Bishops attended at different timings in Calcutta. ELECTIONS: After lunch, the Indian Report was presented by Dr Celcio Dias. 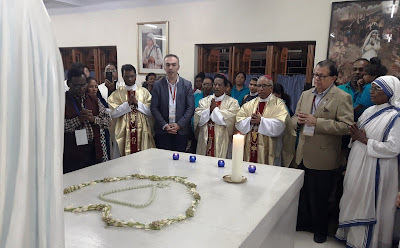 Then Fr Shelton from Sri Lanka led the Adoration of the Most Blessed Sacrament. 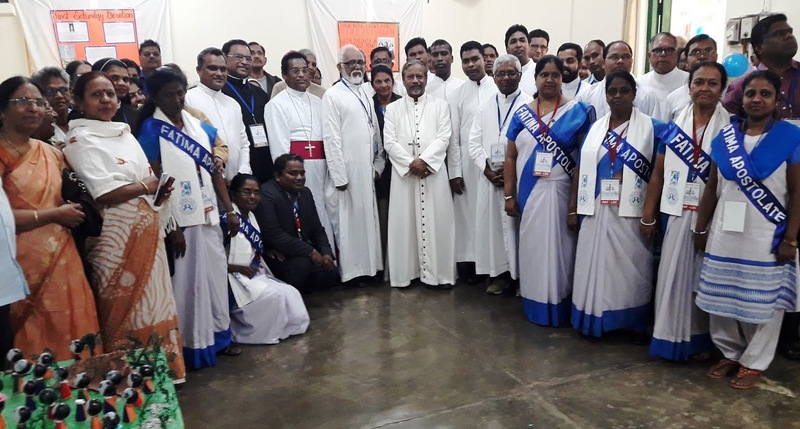 At the Indian National Elections, Dr Celcio Dias was elected Chairman, Fr M. V. Sunny as Vice Chairman, Mr Shelton Pyster as Secretary, Mr Julius Fernandes as Treasurer and the Trustee members: Fr Jiss Jose, Mrs Carmeline Vaz, Fr Francis D ‘Souza, Fr Joseph Susainathan and Mr Robin Boidya. This was conducted by Prof. Americo and Mr Nuno by show of hands as accepted by all. Newly elected members spoke and the Chairman expressed the hope of all working as a team with support and prayers of all. He mentioned about the post Fatima Centenary experience of opening of hearts and conversion of many from persecution to Grace and Mercy. 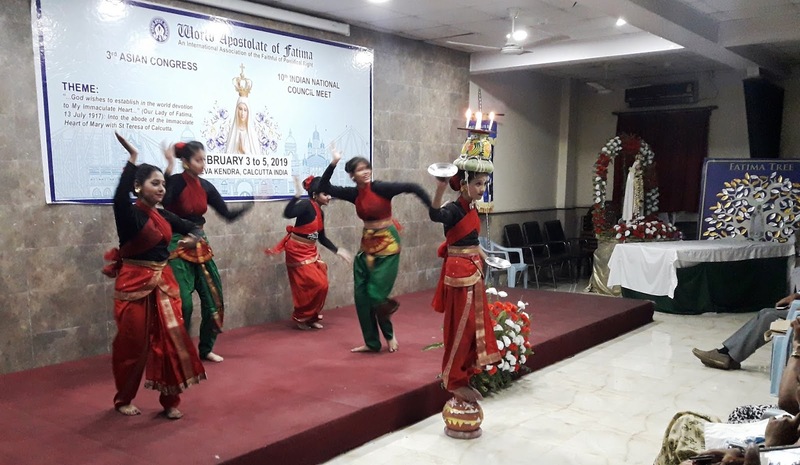 Prof Americo then spoke on “Our Lady of Fatima and 100 years of Grace and Mercy.” This was followed by a Cultural program which included a professional Bengali singer and children dances. The cultural program enthralled the crowd. These children then asked questions to Prof Americo and Mr Nuno. REPORTS: On Tuesday 4th February: day 3, the International Secretariat Fatima Report was done by Nuno. The Holy Relic of Sts Francisco and Jacinta were exposed for veneration for all. Then was the Workshop conducted by Mr Reynald of the Philippines on areas: Prayer, Membership, Organization, Formation and Youth & Children. Due to time constraint, this could not be completed here, but would be analyzed and then emailed. 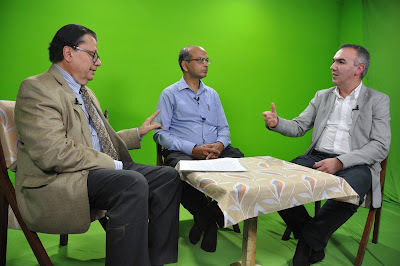 Then was a talk on “Present, future and sense of Urgency of the Message of Fatima” by Prof Americo. The outgoing National Board had a private meeting. 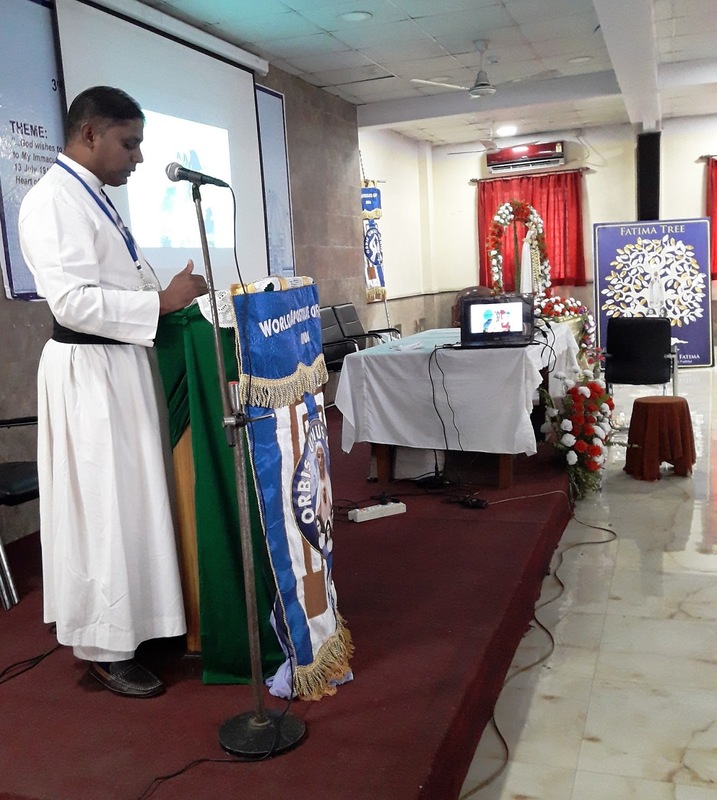 Fr Sunny then spoke on various areas and how to start a WAF unit in your Diocese, Parish or Community. Copies of the conferences by Prof. Americo were made for the participants to meditate its contents at the request of the delegates. Holy Mass at Mother Teresa’s tomb followed, with the new Bishop Fulgence Tigga of Raiganj as the main celebrant. Brown Scapular Enrolment was also done at Mass. 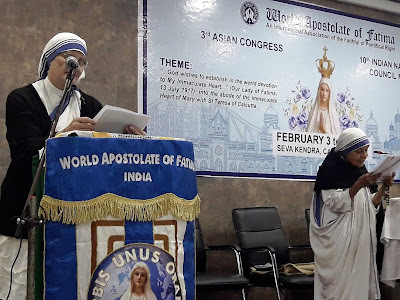 Before this was a talk to all Sisters Missionaries of Charity of St, Teresa of Calcutta living in the Mother (General) House, the Archbishop of Calcutta, numerous priests and others on “How to enhance the triumph of the Immaculate Heart of Mary” by Prof Americo Pablo Lopez Ortiz. 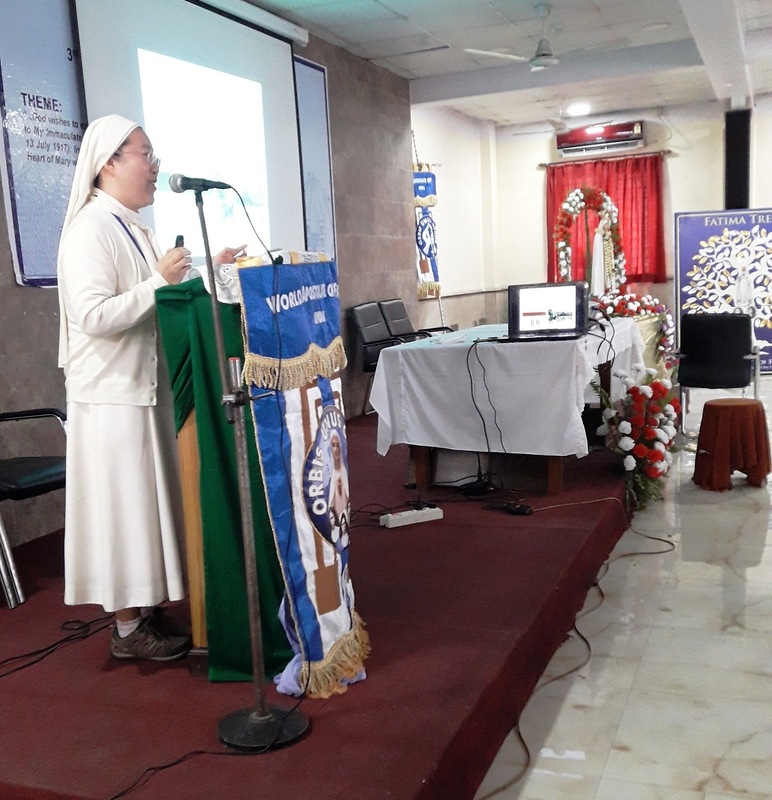 The conference by Prof. Americo was based on the Immaculate Heart of Mary and the Spirituality of Fatima and its role in the foundation of the Congregation of the Missionaries of Charity by St. Teresa de Calcutta. A copy of the conference was requested by the Superior General “to be used for the meditation of the Sisters in the following months.” Then was the group photo at Seva Kendra. RETURN HOME: On Wednesday, 6th February 2019, most left for home and some for the Goa celebrations. The daily morning prayers were: Morning offering, Holy Rosary, etc. 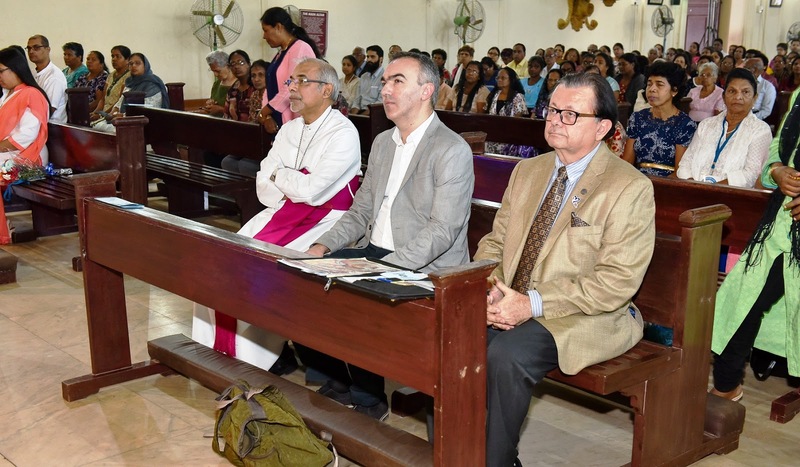 WAF Calcutta under Mr. Shelton Pyster, Mrs. Glynis Vincent, Mr. James Lingam, Mr. Amitavo Banerjee, Mr Albert Rodrik, all under Fr Orson Wells and many silent members excelled as hosts. 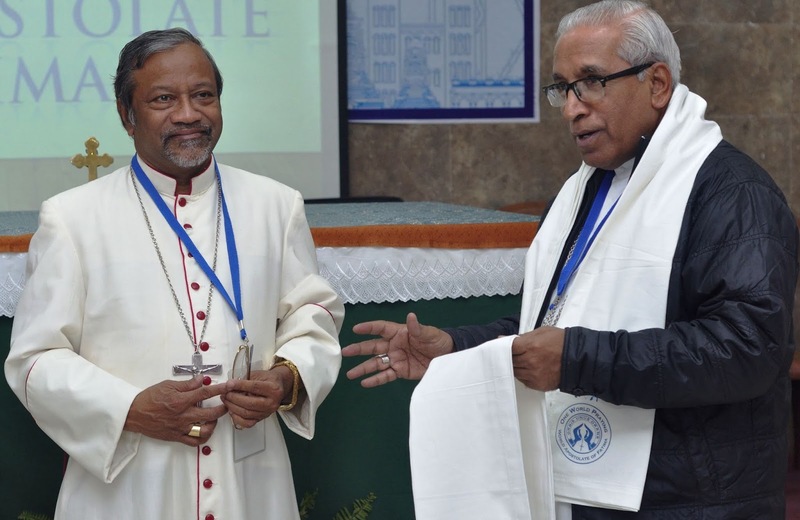 Archbishop Thomas was the Organizing Chairman and would personally chair the preparatory meetings months in advance. 1] Experience of God’s Grace and Mercy through the Holy Mass, Adoration, Veneration, prayers especially Rosary, Holy Relics, talks, procession, pilgrimage and fellowship with others. Months earlier, many were doing the daily Act of Consecration of this Congress to the Immaculate Heart of Mary and so could experience the promptings and moving of the Holy Spirit. A Souvenir will be released shortly. 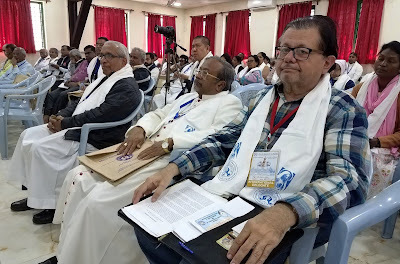 Archbishop Thomas D’ Souza, Archbishop of Calcutta was present at almost all the celebrations.There has been a rekindling of Our Lady’s Message of Peace. 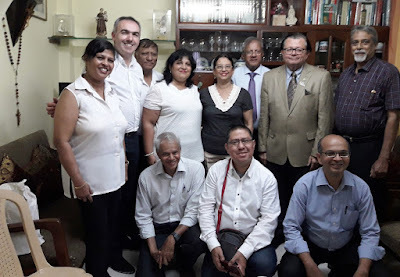 3] National Meeting of all related to Our Lady of Fatima: Parish Priests and Chaplains whose Parish or Chapel is dedicated to Our Lady of Fatima, nuns, Communities, WAF members and anyone interested. 4] Proclamation of the Fatima Message to all via various social media, TV channel, internet, etc. 5] This was the first National Meeting outside Goa. 6] Some members are ready to travel to Philippines to study in depth their formation programs. 7] Our Lady’s Message proclaimed to many local Priests and MC nuns who were guests for this. 8] 100 decade group Rosary propagated by S. Korea for almost impossible situations. 9] Children and Youngsters Reparatory Adoration for good to triumph over evil. 10] Consecration of Parish or Chapel before visiting to introduce the Fatima Message and WAF as in Sri Lanka. 11] St Teresa of Calcutta was our founding member and now is our powerful intercessor. 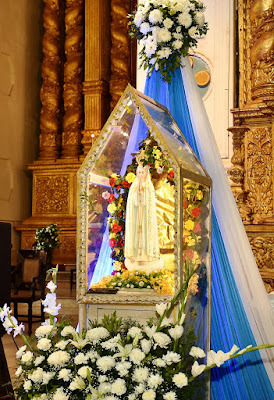 12] Interest in pilgrimage to Fatima. 13) Profound contents of the talks by Prof. Americo Lopez Ortiz, the International President of the WAF, opened new horizons on the Message of Fatima and its pastoral contributions in the live of the Church; better understanding of the theology and spirituality of the Message; offering new developments on the urgency of the Message in our times, taking advantage of his many years as investigator of the Fatima Apparitions and Message and his fourteen books published on these topics. 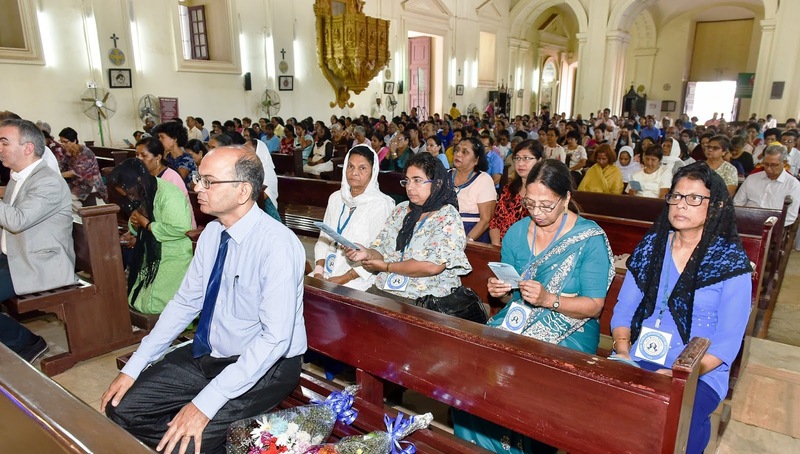 Mrs Eliza Gomes General Secretary led the opening Prayers to the Holy Spirit, St. Michael and Memorare. Then Archbishop Patriarch Filipe Neri Ferrao, Prof. Américo López-Ortiz, International President, Mr. Nuno Prazeres Director WAF International Secretariat at Fatima, Mr Godfery Caluna from Oman, Fr Patricio Fernandes, SJ Rector of the Basilica and Fr Loiola Pereira, Archbishop’s Secretary and Fr Peter da Gama Goa unit Spiritual Advisor and Mr Tony Rodrigues were welcomed by Mr Francis Barreto, Goa unit and National Centre Chairman with flower bouquets presented by others. Then Fr Patricio spoke briefly on the Basilica. Prof. Américo summarized in a profound conference the Fatima Message particularly the forgotten message of the First Saturdays, followed by Mr Nuno’s greeting of welcome to all to Fatima. This was followed by Holy Mass with Archbishop as main celebrant along with Fr Jorge Fernandes, Director of Diocesan Centre of the Lay Apostolate, Fr Cipriano Da Silva Parish Priest of St Michael’s Church Taleigao and above priests. 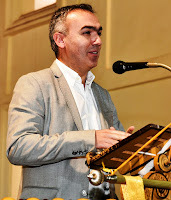 Dr Celcio Dias, International Secretary and newly elected Chairman of the National Board thanked all. Then snacks were served to all outside. 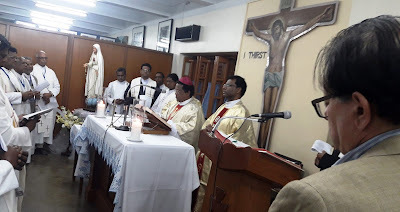 Archbishop Felipe Neri also offered the Mass for the Church, delegates and especially Prof. Americo’s intentions as he was celebrating his birthday this day. Adoration of the Most Blessed Sacrament followed, led by Fr Peter da Gama and Fr Patricio led the Most Holy Rosary. Then Fr Peter did Brown Scapular and Pledge enrolment or renewal and concluded with sprinkling of holy water. 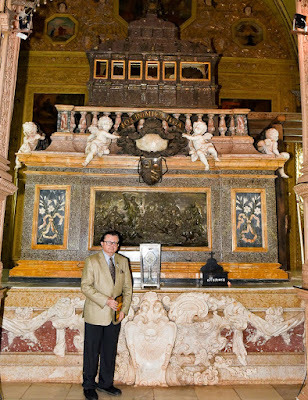 Then was the veneration of the Basilica Statue of Our Lady of Fatima, Relics of Sts. Francisco and Jacinta and St. Francis Xavier. Mention was made of the privileges of veneration of relics of healing and driving away evil spirits. Lunch packet and water bottles were distributed. Special kits containing information on Our Lady of Fatima in leaflets, etc were distributed to Parish in charge of the Legion of Mary to 25 Parishes and other leaflets to all. All left by 1 pm thanking God for the Grace and Blessings. The mission was to proclaim the forgotten Message of Our Lady of Fatima and spread through the Parishes in Goa Archdiocese through the Legion of Mary. Chairman Francis S. Barreto hosted a lunch at his residence accompanied by Spiritual Advisor Fr. Peter da Gama, Executive Committee members and the choir. 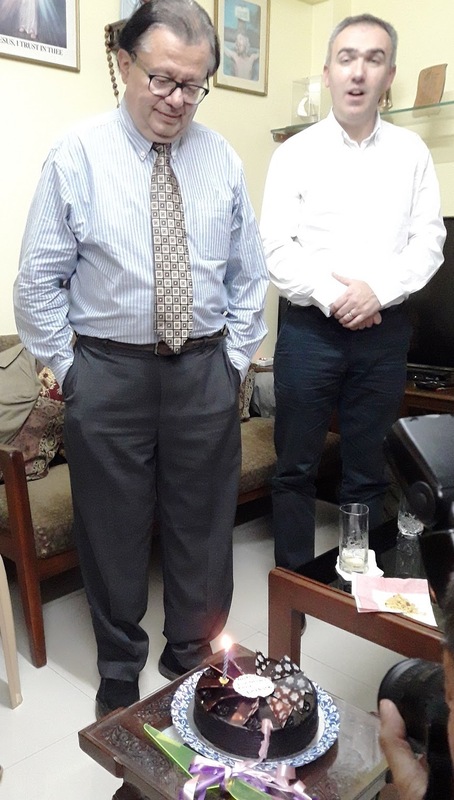 A cake was cut for it was the birthday of Prof. Americo Lopez. Besides ‘happy birthday’ the choir also sang a mando and a Portuguese song ‘Vem Vem Minha Fleur’ appreciated especially by the delegates which also included Godfrey Caluna from Oman. Please feel free to add your content and photos for local publishing. Please email celciodias86@gmail.com if you need higher resolution photos. The first reading from the prophet Jeremiah is a beautiful episode of the scriptures of God’s love for his children and God depends on human support, isn’t it marvelous? God who said in one word: “let there be light.” and there was light. The same God entrusts his word of which he now gives to people to ordinary men to ordinary women in his kingdom. Jeremiah was a young man and God said I have selected you from eternity, you were in my mind before I appointed you and sent you to my people to proclaim my word to them. Whatever is against my will for man, you will put it down, you will destroy it. And you will build a new society, a new people, a people that will follow my teachings and Jeremiah expressed his lowliness, unworthiness, inadequacy. He said Lord you have given me a big mission but I am a very young person. How will I face all these people to whom you are sending me and if I open my mouth they will all laugh. I have no experience I am only a man. And the Lord said, “don’t say you are a young man. To whom ever I will send you will go and proclaim my name because I will be with you, I will be with you.” That confidence And the reassurance changed Jeremiah, but we know latter on when Jeremiah proclaimed God’s word many accepted it. But there were a lot who did not accept it. They would have killed him, they put him in a well, which was dry fortunately. And from the depth of the well Jeremiah cried out, “Lord when you called me when I was young you said, you will be with me, where are you now I am in this well. Where are you then?” And then he said, “in my heart there is a fire to proclaim your Word.” Fortunately his friends, some of them pulled him out of the dry well and he started again his mission of proclamation of God’s word. Dear bother and sisters this is our story. Jeremiah’s story is our story for each one of us because God has chosen you and me unworthy that we are, for His work. We may say what can I do. I am a limited person. I do not know how to speak, I do not know whether others will accept what I say when I say, “God said this, will they accept my word coming out for we do not know.” And yet in the depths of our hearts we feel that being as Christians appointed at the time of our baptism, strengthened by the power of Holy Spirit at confirmation and nourished by the word of God and the sacrament of the Eucharist and other sacraments. We have been strengthened for God’s work. And that is why we also like Jeremiah chosen by the God and His word can go ahead and accomplish what God wants us to. That is the beauty in our mission in the world today. Now to do this we must have deep faith not the simple spiritual faith it is a total trust in God. As St Theresa of Calcutta would say total surrender, total surrender to His will. And that word surrender means that whatever happens in my life. I know that God is there to help me. I am safe in His hands and the mission he has given me will be accomplished. That is what Jesus tells us in today’s Gospel. When he saw the masses, the people were disappointed because He refused to do miracles that He had done in Capernaum not very far from Nazareth really but he would not work miracles in Nazareth amongst his own people the Gospel says. Because there was lack of faith in the people. They said how you can do all that, is he not an ordinary person, they did not recognize him. Is he not Joseph’s son did he not grow up amongst us? Can he do anything miraculous? And He was able to, but he could not do it here. But Jesus said, “no you do not have faith.” and gave the example from the Old Testament: How when the whole land of Israel was dry God sent his prophet Elijah to a woman who was a widow who was of insignificance. And through her fed the prophet Elijah. Similarly Naman who was not a Jew but had come from Syria to be healed of his leprosy. And he was healed though he was not a Jew. What does Jesus want to say it is not enough to be Christian you must recognize me. You must accept me you must surrender yourself totally to my word then I will work miracles in your land. Not just to say I am an old Christian. I was and my ancestors were baptized many, many years ago. That alone is not the credibility for God’s work in us. It may be a new Christian. It may be recent Christians. What matters in both cases, is the depth of faith. Do I surrender myself to God’s will at all times? Then in our humility, God can work miracles. That is what Jesus wants to tell us. When we come to attend mass or rather offer the Holy Eucharist. Do I go with total faith bringing myself as I am. And surrender myself in the form of bread and wine? And receive Jesus’ body and blood to be nourished and go out a strengthened person to serve my brothers and sisters in this place? Then Jesus’ presence in my life, in my heart will bear fruit. And for this, St Paul tells basically we mean love. For God’s words, we need faith, total surrender and we need love. St Paul enumerates the many qualities of Love. Love never dies, love endures, and love tells us not to see what is wrong in some one. But love encourages us to see what is good in some one. And we join that person in generosity. All those qualities Brothers and sisters is good for us to go through those for our own spiritual nourishment so that our lives become a day offering of love to God. Today we are here in Bandel to pay our respects to Our Mother who leads us always to Jesus. This place in Bandel has origins with the Portuguese. And what we are celebrating is also Our Lady of Fatima and that is why our entire group that has come here as devotees of Our Lady of Fatima. And Fatima is in Portugal. So Fatima in Portugal and Bandel in India we seem to be connected in history, and who connected it? Mary our Mother. Mary our Mother to give Jesus to the world so that when she appeared to the three shepherd children, Lucia, Francisco and Jacinta her message was of conversion. Conversion not of one religion to another she did not mean that. Conversion of heart, conversion of heart. In our devious sinful ways, devious sinful ways, become men and women of prayer, do sacrifices, pray for sinners, have great devotion to Our Lord in the Eucharist, the devotion to the Holy Rosary, the first Saturdays of the month. With a clean heart receive Jesus and consecrate yourself, your family, your community, your country, your world, to my Immaculate Heart said Mary. And since then her message has been a message for the whole world. We have many trials perhaps in our families, in our personal lives, in our communities around us, political troubles, social troubles, many types of troubles, in the midst of all this comes our Mother with a message from her Son, the same message of the Gospel. You must become holy, you must change your heart, from sin to holiness, you must give up sin in any form and become holy. And our Holy Father Pope Francis in his recent letter “Gaudete et Exsultate” to the entire Church helps us how to be holy. All are called to holiness, the entire church is called to holiness. And to be holy we must do ordinary things extraordinary in value. Live the life of beatitudes to the Gospel. And where God has place us in his providence there we are called to be holy. For me as a bishop, for our priests where they are, consecrated men and women, the lay faithful where ever they are there is our place of holiness. But all of us are called to holiness that is the message of Mary our Mother. We may say like Jeremiah how can I do this, this great mission. I am a small person, I am an insignificant person. Our small community small family, our churches small in number. We are few parishioners what can we do. And like God who showed Jeremiah I will be with you, I am with you. Brothers and sisters with this assurance God is always with us Our blessed Mother Mary is with us when we do the mission that is given us then we will accomplish for Jesus for Mary for the church many great things though we are apparently insignificant. But with God strength everything is possible. That was the message the Angel gave to Mary nothing is impossible for God. Dear brothers and sisters, Mary has connected Fatima and Bandel. Mary who has been our Mother giving us a maternal care, given us warning from God in a way because mankind was sinning and she was giving the message to change otherwise will bring about destruction, ruin, people will go to hell. No we can prevent it by prayer, sacrifices and change of lives. Live life in holiness; give up sin, with that message always and everywhere. Love may resonate in the hearts of people. This must be our own hearts and reach our families our communities, our parishes, our dioceses, especially our Diocese from Calcutta and all the countries that we have come for and represent. May Mary’s message spoken in Fatima a 102 years ago, continue to bear abundant fruit for the kingdom of Jesus so that there will be a kingdom of Love, a kingdom of peace and a kingdom of joy. Amen.